Being "green" is no longer just a trendy fad. A commitment to conservation and eco-friendly living is needed to help preserve our planet and its resources for today as well as future generations. Most organizations and businesses have adopted "green" practices and communities are establishing recycling programs and other methods to make it easier for residents to do the same. 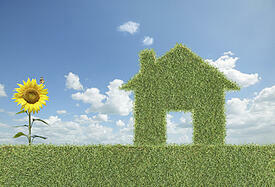 How have you incorporated "green" living in your home? As a member of our Springs Apartments community, there are a number of ways you can follow a sustainable, eco-friendly lifestyle that don't involve a lot of expense and inconvenience. Use these tips to get started or add these ideas to ones you already follow. Did you know that most electronic equipment is still consuming energy even when they're turned off? DVRs, DVD players, video game consoles, computers and TVs are actually in an idling mode, especially if they use a remote control. Wherever possible, unplug any high-tech equipment when not in use. Each year junk mail consumes 100 million of our planet's trees. Go to DMAchoice and learn how you can manage what items show up in your mailbox. Most companies and financial institutions also offer paperless programs so you can receive billing and other communication via email. Visit their websites to enroll. It's nice to keep up with the latest and greatest in gadgets, but don't let your old high-tech clog up a landfill. Earth911 has information about safely disposing of these products as well as auto parts, household waste and other awkward items. Support farmers and other suppliers of sustainable, locally-produced foods. As a bonus, you'll receive the physical benefits of maintaining a healthy diet. LocalHarvest is a site that helps you locate farmers' markets and other nearby resources. Learning more about your energy usage profile may uncover areas where you can make improvements. The Nature Conservancy offers an online carbon footprint calculator that shows your impact on the environment based on transportation, diet and other lifestyle choices. Get results based on yourself or your entire household. Both plastic and paper bags at grocery stores and other shops create incredible amounts of waste. Invest in a reusable canvas tote bag to carry your purchases. If you can't start the day without a visit to your favorite coffee shop, keep a reusable insulated mug handy. A difference of only two degrees up or down on the thermostat can save up to 2,000 pounds of carbon dioxide. Keep that in mind when setting your indoor climate controls. Our Springs Apartments team thanks you and all our residents for being thoughtful and considerate community members. Please don't hesitate to share your ideas or suggestions for "green" living.